Throughout James’ time at King Edward VI School, it was based at New Street in the centre of Birmingham. The impressive school building was demolished in 1938 when the school moved to it current location in Edgbaston. The old school building features in two short films which explain its architectural importance and memories of past pupils. Prior to his marriage to Lucy, James had raised a family of 5 children, born between ca. 1871 and ca. 1891, with his first wife, Elizabeth Fanny Pursall. The family resided at Spooner Street, Aston (1871 & 1881 census), and Kingswood Road, Kings Norton (1891 & 1901 census). Elizabeth died in 1899. At the time of James and Lucy’s marriage, James’ youngest child, Gladys Fanny was aged about 12. The older children may have left home prior to 1903, but Gladys resided with James and Lucy at 55 Church Road, Moseley in 1911. James was included in the electoral register in 1868 (Spooner Street) and 1912 (55 Church Road). Consequently, I can conclude the properties he occupied were rated above the minimum value, which suggests a comfortable economic position. 55 Church Road is a semi-detached house. The adjoining semi, no 57, was described as a spacious 5 bedroom property with 3 reception rooms, 2 bathrooms, kitchen and cellar when offered for rental in 2011. 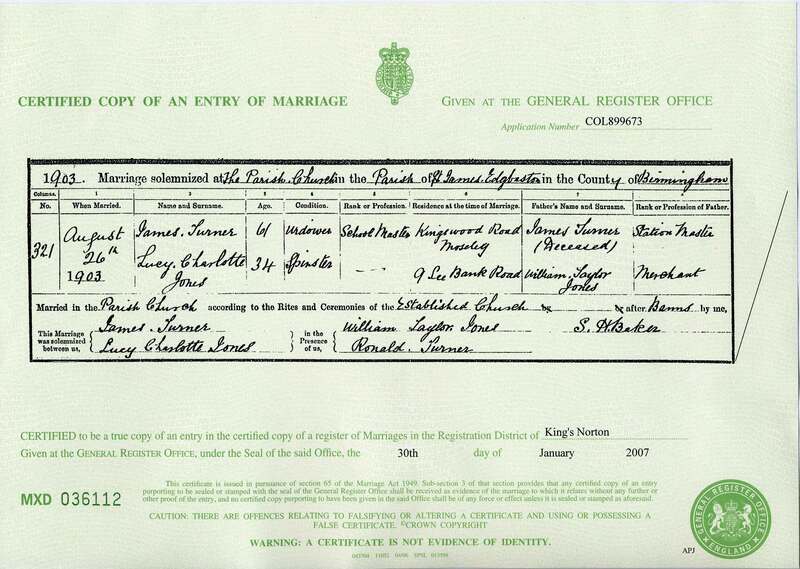 Both James and Lucy appear on the 1920 spring electoral register, published on 15 May, as occupiers of 55 Church Road. The death of James Turner, aged 78, was registered in the July-September quarter of 1920 (Kings Norton district, Vol. 6d, page 38). The degree to which Lucy was supported by James’ pension after his death is unknown. Having married a man 27 her senior, it is not surprising that she faced a long widowhood from the age of 41. According to family hearsay, Lucy became a lady’s companion after James’ death and later lived with her brother Charles Bertram Jones. The 1930 electoral register shows her living the household of Ewart Vane Parsons, with 5 adult women sharing the Parsons surname, at 106 Woodlands Road, Sparkbrook. In 1911, Ewart Parsons and his sisters, aged between 22 and 38, lived with their mother Isabella Parsons, aged 64. Lucy’s residence in the Parson household is consistent with the lady’s companion story. The 1950 electoral register confirms that Lucy C Turner and Charles B Jones resided at 4 Torquay Terrace, Sparkbrook. Charles had been widowed in 1946 and his children had all married and left home. Lucy’s death was registered in the July-September quarter of 1952 (Birmingham district, Vol 9c, page 420). Lucy’s grand-nieces, who sadly remember the seed cake she baked as dry and unpalatable, were no older than 12 or 14 when they last tasted the recipe on a visit to their ‘Grampy Jones’, Charles.